Last blog post, we talk about using derivatives to compute the tangent lines of functions at certain points. Another application of derivatives is finding the normal line of a function at a certain point. A normal line is a line that is perpendicular to a tangent line. 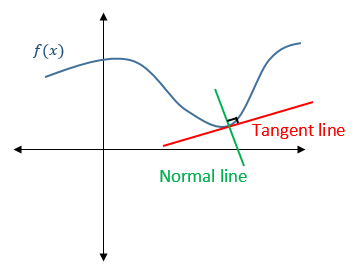 The slope of the normal line is the negative reciprocal of the slope of the tangent line. The steps for finding the equation of a normal line is pretty simple, as long as you’ve mastered finding the equation of a tangent line. Finding the equation of a normal line is very similar to finding the equation of a tangent line. Since the steps are similar, make sure you don’t confuse and mix up the definitions of a tangent line and a normal line. For more practice and help with normal lines, check out Symbolab’s Practice. More educational tips! Just click here mate! The topic of the derivation is one of the difficult tasks and most students did not understand this subject. The reason is that students did not know the basic rules of the derivation and this is the main reason that students did not learn this subject with writing service. This is really so cool information about the derivation. The best and most important thing is to keep in mind that great and very relevant information is found on various pages, and that where the energy and will to keep browsing come from. I like what I see as I find it very informative. When you aren't sure where to find the most reliable CV writing help in Kenya, we are the best choice. We always deliver the best assistance, thus giving clients the chance to keep having the chance to find the best jobs. Many students perceive Mathematics as one of the hardest subjects and so they always feel unconfident to handle Maths tasks. What if you found that there is a way to get your High School Mathematics problems solved by experts? You can easily get Academic Assignment Help from professionals online, and be assisted to accomplish such Maths tasks. This is really a nice and informative, containing all information and also has a great impact on the new technology. Thanks for sharing it. get fix satta matka game here. This is what you call a quality content which only a professional writer can create. From the beginning to the end, it’s a classical piece of writing. Creating interest and quality while maintaining the relevancy at the same time is absolutely not that easy, in fact, it’s one of the biggest obstacles a writer faces.